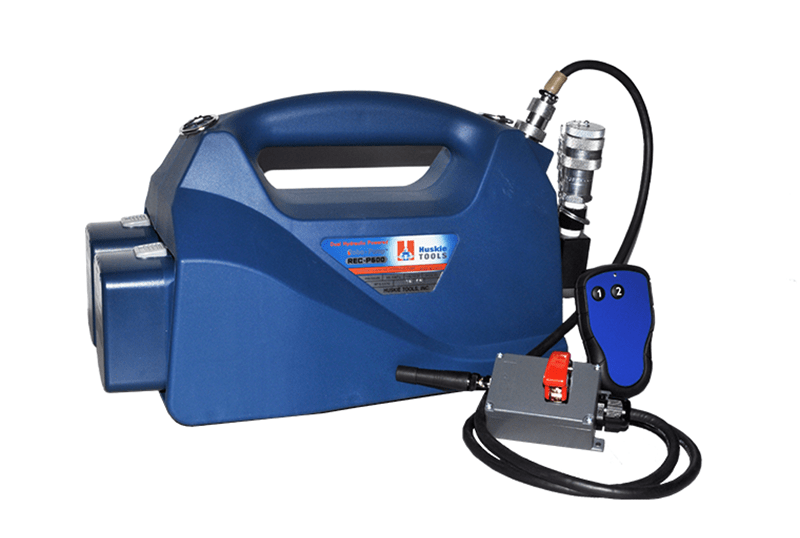 The Huskie REC-P600R is a wireless, remote operated, single acting hydraulic pump. It is our lightest most versatile hydraulic pump. The REC-P600R incorporates a high frequency receiver exclusively paired to a heavy duty cordless remote. The weather resistant IP65 rated remote utilizes two push buttons to advance and retract the tool. ; This wireless application was designed for a safer and smarter way to cut cable, eliminating injuries from potential arc flash on live cables. This allows the operator to distance themselves further from the cut for a fail-safe operation. The external receiver incorporates an on/off switch and comes standard with 6 feet of cable. ; The REC-P600R has the ability to work off of 1 or 2 Huskie batteries. It is recommended to operate the pump with a 10-foot hose. A longer hose will cause cycle times to increase. ; We recommend you specify the Huskie SC-Series flush face dripless coupler, as not to deplete the oil in the reservoir when changing tool heads. ; The REC-P600R comes with the standard 3/8” Screw type coupler.